What can we learn from a flywheel? 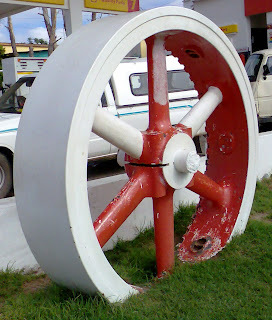 A flywheel as you may already know is a huge piece of metal disk with its center mounted on a horizontal axle. Being thick and heavy, flywheels have a characteristic advantage of sustaining its energy and momentum due to its weight. It resists changes to its rotation thereby delivering almost constant motion. It can accelerate and produce high power from a relatively small source with only pulses of inputs to it. We can draw some parallelism to the flywheel and any organization of people trying to reach a certain level success or even greatness. Just like in a flywheel, people need to put their efforts constantly to produce results. Each effort made to improve the organization will have a net effect of making that organization a better one. But the key thing is whether or not the efforts are in the same direction since opposing forces just cancel out each other. Moreover, the flywheel will not attain its acceleration with only a single thrust. This is what some people try to do with their “new idea” or “big programs” that they advertise and hope would motivate people to produce great results. In contrast, the actions should be made in a deliberate, constant and long-lasting manner. This is difficult to do since it entails changing not only the course of action but also the mindset, habits and cultures of organization and its people. It’s difficult but not impossible. And it’s necessary since it’s the only real way to achieve lasting change and success. What happens, though, if your thrusts are too far apart from each other? The flywheel will not gain any acceleration at all but will just have blips of motion. So it needs follow-through efforts effectively. We need constant and aligned action which will move the people in the right direction. And when it does create some acceleration, you’ll notice that the same amount of effort results to even faster motion and success because the momentum just builds on top of another. Same is true with any groups, teams and organizations which hungers for victory. With the flywheel concept, you know that results may not be immediate because for the energy to be unleashed the momentum should build over time. Thus, people need to have in them a sense of faith that what they are doing is the right thing to do before they can actually sense that achievement. There is a difference in making the right effort with the results not forthcoming and doing the entirely wrong thing having no results to show for it. Knowing the difference is another topic worth discussing. Let’s do it next time.